There is a myriad of URL shorteners. is.gd and v.gd have options to create custom short URLs in lower case and pronounceable. They also supply statistics. Two UK based, ethical and free, URL shorteners are is.gd and v.gd. They are from the same stable. But how in the world can a URL shorten service stand out from the crowd? These two do so by offering custom short URLs from a site that has no third-party advertising, and that is proactive in preventing spam / misuse. Even Wikipedia allows is.gd shortened URLs. Not many shortening services can boast that. is.gd is ranked ~#18k on Alexa Traffic Rank worldwide and ~#10.5k in the US, which is interesting as it is UK based and hosted. It is ranked ~#3.5k in Colombia, ~#9.6k in UK, and around #10k to #11k in Saudi Arabia and the Philippines. There are ~52k sites linking to it. There is no appreciable difference in site traffic demographics from the internet norm. Most traffic arrives from the United States (28%), China (~14%), India (~11%), with the UK (~6%), Germany, Colombia, Mexico, Russia, Spain and Canada send between ~4.5% and ~2% each. The main sites sending traffic are google.com, Twitter, Facebook, YouTube, Yahoo! and Wikipedia (the latter only uses short URLs from trusted URL shortening services). v,gd is the daughter site to is.gd and ranks ~#400k worldwide in Alexa Traffic Rank, and ~#260k in the US. Just about 350 sites link to it. Visitors are mainly from the US (~23%) and the UK (~10%). Almost all of them arrive from Facebook (~56%), is.gd, Twitter and google.com, in that order. The demographics for this site are skewed towards males, those in the 25-44 age range (skewed away from 55+), browsing from home, and with higher education (skewed away from lower education). The only difference between the two sites is that the shortened URL from v.gd shows a preview before the user is redirected to the underlying web-page. With the is.gd shortened URL you are redirected direct to the underlying web page. There are two sites in the stable: is.gd and v.gd. The only difference between the two is external. When the v.gd short URL is copied to the URL box it returns a preview of the underlying web-site. The is.gd URL redirects directly to the underlying web page. As they are identical in the way that they create short URLs I shall only describe the is.gd (parent) URL shortening facilities. 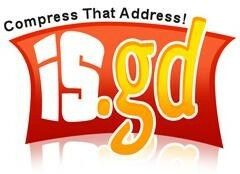 is.gd is a free URL address compression service, set up in 2007, and run from the UK. It is proactive in preventing spam and misuse. There is no third-party advertising on the site. Creating compressed short URLs is easy and straightforward, with a twist or two for your delectation. The easiest way to create short URLs from long URLs is to just enter or paste the long URL into the appropriate box and click 'Shorten!'. You can continue to compress others of your URLs if you so wish. But there are further options, to customize the short URL created, to your own taste and requirements. You can even get a QR code for any of the custom short URLs you produce. You do not get statistics by default. You need to set the 'Log statistics for this link'. This can be done in conjunction with any of the custom short URL formats. When you enable statistics for a link, you can access them via a preview page for the link, at the short URL address, with a hyphen at the end, such as: http://is.gd/4LF7FZ-. By clicking on the 'I want to see statistics for this URL' you will get the stats. The information you receive looks limited at first site, but there are a number of options available to you. Pretty much all you might want. And there is also a breakdown of top referrers by channel. Further information can be gained by clicking 'My recently shortened URLs' on the home page. The details for your recently shortened URLs are held on your computer in cookie format. It is done this way to alleviate the need for registration. The two UK based URL shorteners are from the same creator. They are ethical, free, and proactive in preventing spam. Glad to have been of assistance Mira. Hi again, I saw your linked article -- thank you! The best bit about these two URL shorteners is the ability to create QR codes. Hi Humagaia, with these shortened URL though, which keep cropping up more and more, how do I know I'm clicking on a legitimate link?